Tableau Online allows you to work with data stored anywhere—in the cloud and on-premises. Whether connecting live or refreshing with snapshots, you have the flexibility to leverage all your data and easily keep it fresh. Read on to learn how to share up-to-date visual analytics across your entire organization with Tableau Online. Connect live to cloud-hosted databases: Query cloud-hosted databases directly without requiring data extracts. This provides you with real-time data updates and leverages your database security rules. Schedule extract refreshes for cloud applications: Automatically update extracts of your data on a schedule when connecting to cloud applications. You can also create and refresh extracts from cloud-hosted databases to leverage Tableau's fast data engine. Schedule extract refreshes for on-premises data: Securely refresh data sources behind your firewall on a set schedule using the Tableau Online sync client. Tableau Online provides live connectivity to cloud databases like Amazon Redshift, Google BigQuery, SQL Azure, and more. Tableau Online also supports live connectivity to other databases hosted in the cloud, such as SQL Server, MySQL, and PostgreSQL running on services like Amazon RDS. When using live connections, your published dashboards always reflect the most up-to-date information in your database and do not require a data extract. You can embed your database credentials when publishing, or you can prompt users to enter their credentials whenever they view a workbook. 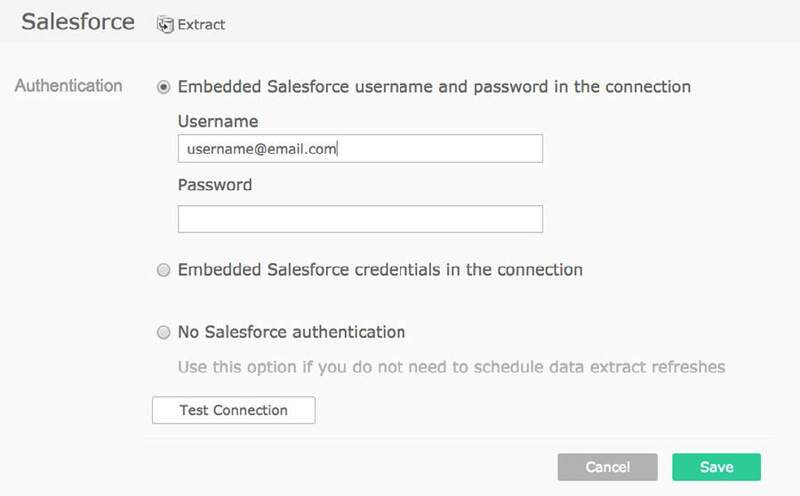 Tableau Online also support oAuth when available. Note that in some instances, your database administrator will need to whitelist Tableau Online's IP address. You can create data extracts from cloud applications like Google Analytics, Salesforce, Google Sheets, and more. Tableau Online also enables you to set custom refresh schedules for these extracts. Refreshes can run daily, weekly, or monthly, and can be either full and incremental refreshes of the existing data extract. You can also manually refresh extracts at any time, allowing you to control the freshness of your data and the frequency at which it is transferred from the source application. Keep data living behind a firewall fresh using the Tableau Online sync client. This client runs on a computer within your firewall and securely manages the communications with Tableau Online. The sync client ‘pushes’ extracts of your on-premises data to Tableau Online on a given schedule. When the client is running, it will automatically connect to your data source, extract the data, and publish to Tableau Online. The client can also run continuously even when you are logged out. Learn more about the sync client here. Tableau Online gives you the flexibility to leverage all your data—whether in the cloud or behind a firewall— and keep it fresh. Begin a free trial today and start sharing visual analytics with your organization easily and securely. Clara is a Product Manager with Tableau Online. She holds an MBA from Stanford University and a BA in Mathematics from Reed College. Prior to Tableau, she worked at Amazon and Microsoft.